* The DVD-Audio content can only be read by a DVD-Audio player. The Dolby Digital 5.1 and DTS audio tracks provided on this disc will play on a standard DVD player. Track 1, 2; Produced by Richie Zito, Curt Cuomo and Eddie Money. Track 3 ; Produced by Kim Bullard, Curt Cuomo and Eddie Money. Track 4 ; Produced by Richie Zito. Track 5 - 14 ; Recorded Live At The Galaxy Theatre July 30 and 31, 1997. Produced by Curt Cuomo and Eddie Money. 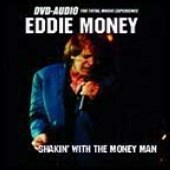 Live album by Eddie Money which includes 4 new studio-tracks. "If We Ever Get Out Of This Place" written by Paul Stanley, Curt Cuomo, Eddie Money and Tommy Girvin . This song is a re-written version of "If We Ever", which appeared on both Stan Bush albums "Higher Than Angels" and "The Child Within". "If We Ever ..... "